Do you like sock yarn? Do you like Harry Potter? Well check this out. You can pre-order the entire Opal Harry Potter sock yarn collection. You can get the yarn for 10% off and free shipping. Right now, I am watching the Olympics, and I am soooo happy that I didn't end up doing the Ravelympics. This would have been yet another KAL that I failed to complete. On Friday, I drove out to some campgrounds and spent the weekend volunteering as a counselor for a craniofacial camp. As you may guess, the 7-year old to teen crowd keeps you a bit busy. I didn't get any knitting done, but it was a totally worthwhile experience. These kids were awesome, fun, and very cute. I am getting antsy to pick a new project. I am not happy with my Flame Wave socks and want to start a new project. I think I am going to knit some Mason-Dixon washcloths, since I can do the pattern in my sleep and know how they work out. At the same time, I would like to knit something new. ::sigh:: Too many decisions! The urge to knit socks hit me last week. 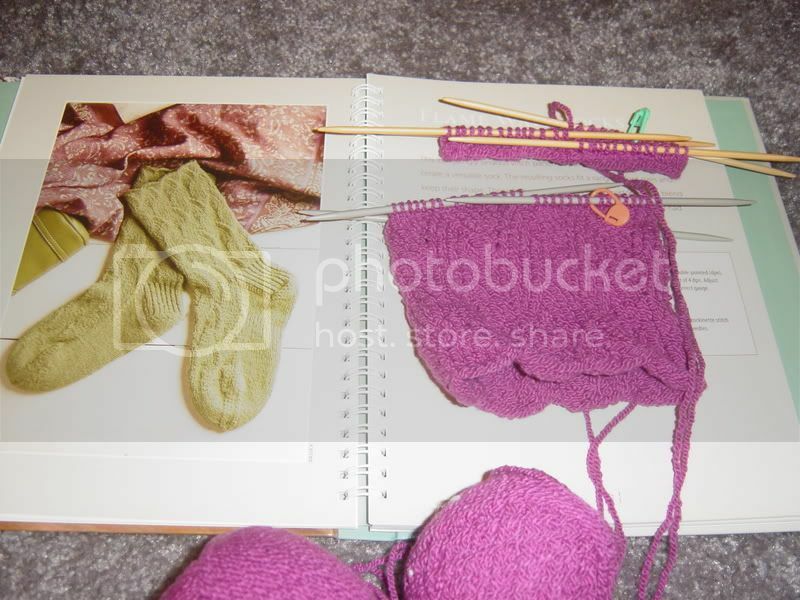 Do you think it is because I surround myself with sock pattern books and never finish two matching socks? Nay! Last week I came across Ann Budd's Flame Wave Socks (Favorite Socks: 25 Timeless Designs from Interweave). The pattern was nice and I really wanted to try out my Cascade Fixation sock yarn. It is stretchy AND cotton! What could be better? Everything started off fine. The pattern was simple. I had the yarn. I had the needles. I jumped right in. The thing is...I am not a fan of checking for gauge. I find it tedious. Okay, I also make a lot of scarves (gauge rarely matters) and hats (I have a basic idea of how many stitches I need for my head), so rarely have I truly needed to find gauge. ANYWAY, I start knitting these socks on size 5 DPNS. This just didn't seem right. I told myself that this was fine, because I was going to go down to size 4 after just a few inches of the leg. "I've been running, so my new muscular calves are going to need the extra room," is what I told myself. After about an inch at size 4, I realized this just wasn't working. The sock just slides onto my leg. The stretch of Cascade Fixation was not being used at all. At this point I started doing a little more investigation into this pattern. According to Ravelry.com, tons of knitters used size 3 for the entire sock, because Ann Budd is a very tight knitter. With all of this information, I designed a new game plan. I started a new sock on size 3 needles. I decided I could compare the two socks. Well, that, in short, was depressing. There was a negligible difference between the two. At this point, I feel I need to work on the size 3 a bit more just in case the sock will tighten up a bit (I barely made a dent in the pattern). I am a bit worried that with the smaller needle size, I am going to need more yarn, which I don't have. Yesterday, I watched Dr. Horrible's Sing-A-Long Blog. It is a 45 minute free streaming movie directed by the fantastic Joss Whedon. It stars Neil Patrick Harris (How I Met Your Mother) as the evil Dr. Horrible and Nathan Fillion (Firefly) as the good Captain Hammer. The first couple of minutes are slow, but once the singing starts, you can't look away. The songs are catchy and the plot is new and engaging. I will post knitting news tomorrow, but in the meantime go watch Dr. Horrible!